Donutorama is a food cart located on the corner of SW 10th and Alder in downtown Portland, Oregon. It occupies the same food cart used by Cool Harry's Frozen Yogurt. 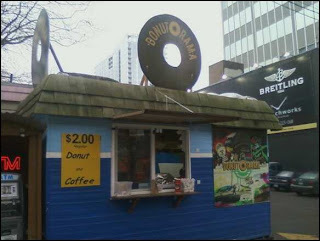 Donutorama is likely sticking around just for the winter, before Cool Harry's returns with the (supposedly) warmer weather. I really liked the mural on the cart, for starters. 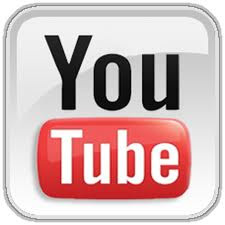 Greg Slauson is the owner of Donutorama. A big doughnut lover, Greg originally had ideas of starting a burger cart, but decided on doughnuts after noticing many burger carts already scattered throughout Portland -- and not seeing very many doughnut places. Greg likes to think outside the box, coming up with new, original creations to stand alongside his "normal" doughnuts (for the less adventurous, I guess). With Voodoo Doughnuts not too far from the food pod, I think it could be a good place for business. 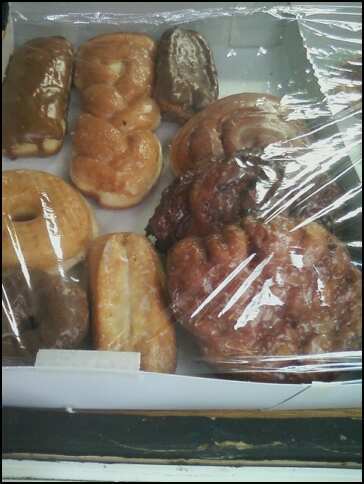 I saw a sign posted on the cart...coffee and a regular doughnut for $2. That sounded good, but I asked Greg if I could get another (more unique) doughnut instead. Greg allowed it with a slight price increase...about a buck more. I was cool with that, and Greg suggested the creme brulee doughnut (normally about $2.50 on its own). In all, I paid $3 for the doughnut and coffee. The creme brulee doughnut contains a creamy custard filling, topped with granulated sugar -- and of course, the sugar gets torched to order. 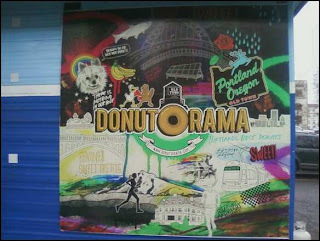 Portland Monthly Magazine featured Donutorama in late December 2011, featuring the creme brulee doughnut! 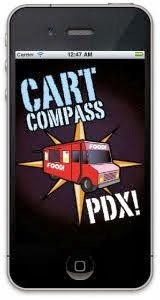 A couple days into 2012, Food Carts Portland also featured Donutorama on its site! 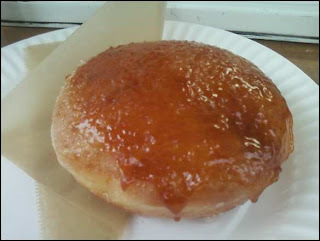 Not surprisingly, the creme brulee doughnut was again the star! 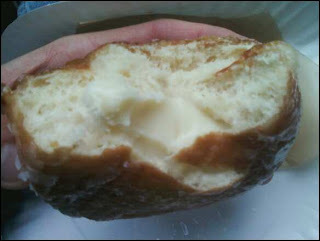 The inside of the Creme Brulee Doughnut! Greg and I chatted while we waited for the caramelized sugar top to harden. 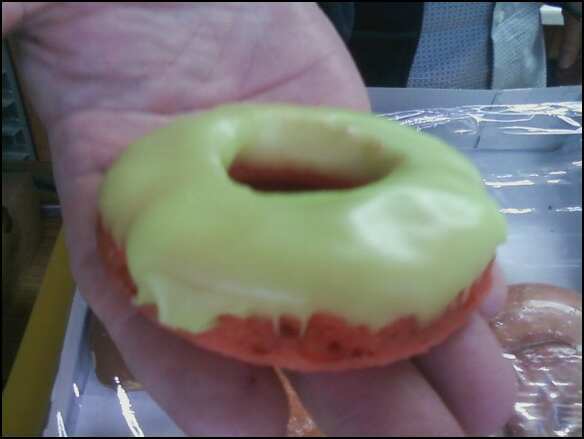 Then I sank my teeth into a ridiculously awesome doughnut. There are multiple layers and textures here: the soft doughnut, the creamy custard filling, the crunchy brulee on top. A triple-threat TKO for your mouth! Greg also showed me (not for sale on my visit) an "energy" doughnut using Viso Vigor energy drink...50 mgs of caffeine! Yeah, combine that with your coffee (or a few cups of coffee, why not) and you may be up all night. 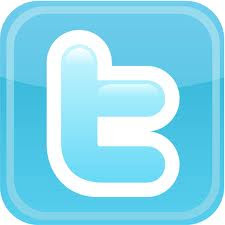 Greg will sell these on occasion, though, so keep a lookout for that! If you're adventurous like me, perhaps you should check out the banana bacon (Greg's favorite) and maple bacon doughnuts. Heck, there may be a PB&J doughnut on there as well! 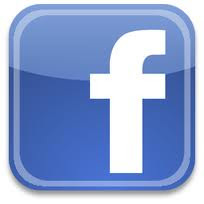 Greg generally rotates different types each day, so like him on Facebook and follow him on Twitter...bug him good to find out what's on the menu! 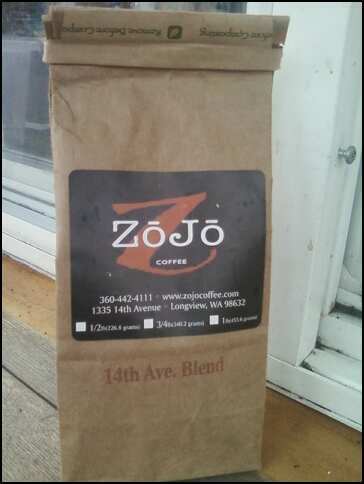 Finally, the coffee is a blend from Zojo, a company based in Longview, WA. I enjoyed the 14th Avenue blend here, especially since it was pretty frigid outside. 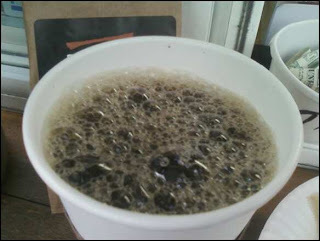 Basically, I'm a fan of just about any strong, non-bitter coffee! Coffee addict representing! Check out Donutorama and try these doughnuts for yourself!